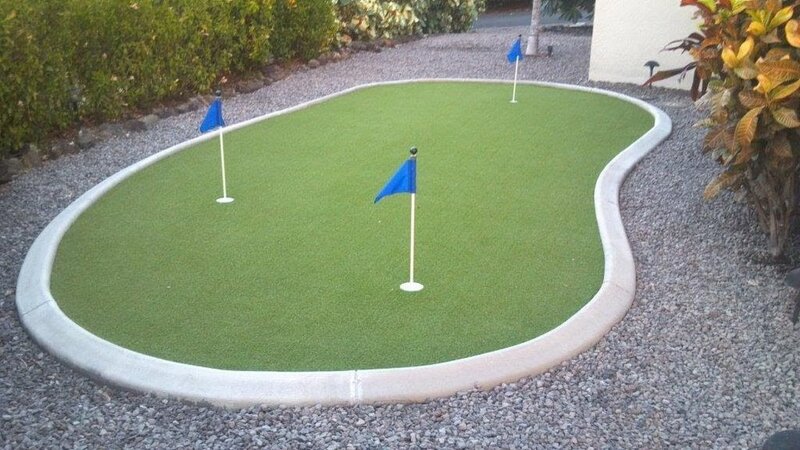 Enjoy natural looking putting greens in residential or business locations! Dreamturf putting greens materials are specially formulated tested and loved by golfers. The quality and durability of the product really looks grass-like and shines wherever we install it. It takes a special designer, landscape contractor, and turf installers to make quality putting greens. Some of the unique challenges are adding proper slop, cup placement and setting, ground prep work, and measuring curves. Greens can be particularly hard to cut out around trees or existing landscaping. You get all the amazing cost and time saving bennifits of an artificial grass lawn. No watering or irrigation hassles, No mowing or edging, no dealing with grass clippings, looks good all year rain or shine, no herbicides or fertilizers. .
"Synthetic Putting Greens are Perfect for Improving Your Short Game year round!" 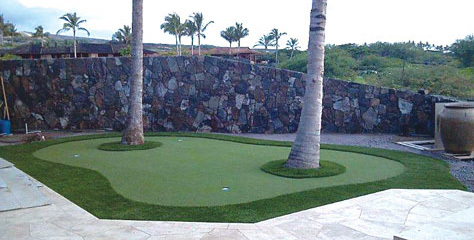 Hawaii Dream Turf putting greens have been getting rave reviews. Unlike low-pile nylon greens that have slow ball speeds of 7-8, our greens are constructed with 100% Polyethylene and will roll at a 10 on the stimp meter. With a true roll and realistic speed, this is the perfect choice to practice and improve your putting stroke. Our putting green turf was selected for the Washington State Putting Championship due to its outstanding properties. This turf has a 5/8" pile height and is ultra dense at 61 oz. face weight. Our putting greens have a two-color blend that gives it a very aesthetically pleasing look. Installation is easier than heavy, sand-filled Polypropylene putting green turf and requires far less maintenance. We can install it any time of the year, and you can be ready for golf season with your short game in great shape!